In the heart of the Fatimid city, north of the site once occupied by the great Fatimid palace, stands a small but important mosque known as al-Aqmar, which means "The Moonlit", sometimes also known as the Gray Mosque. it was founded by Ma'mun al-Bata'ihi, during the caliphate of al-Mustansir. It was built during a time of great political and spiritual crises for the Fatimid regime. It is located on the main artery of the city. In plan, it is a regular, rectangular hypostyle mosque with a square courtyard. It is essentially the plan of a small congregational mosque. This structure is of major importance for Cairo's architecture for several reasons. 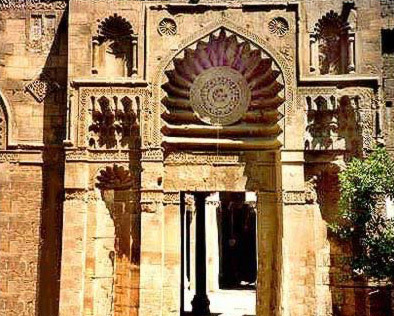 First of all, it is one of the seminal monuments in Cairo's architectural history, being the first mosque with an entrance that is not on an axis with the qibla wall. Here, the facade follows the alignment of the street, while the qibla wall is oriented to Mecca. It is therefore the first example of a mosque in Cairo with a ground plan adjusted to an existing urban street plan, a phenomenon which over the ensuing centuries was to become increasingly common and complex. Here, the plan is rather simple. For the most part, the interior has a regular layout with the exception that the facade wall is thicker on one end than the other. Into the thicker part of the wall, a vestibule, a staircase and two rooms opening into the interior were built. It is also the first mosque in Cairo to have a decorated stone facade. The facade is brick faced with stone. A wing to the right of the entrance salient, balancing that to the left, was covered up by a later house. However, in the 1980s, a restoration by the Bohara Indian sect unveiled the hidden part and returned the facade to its original balanced proportions. The middle of the tripartite composition is dominated by a protruding portal decorated with a large keel arch niche carved with fluting radiating from a central medallion, like a sunrise or shell motif. 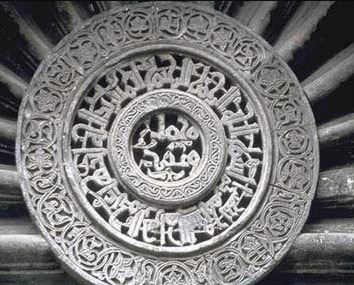 The medallion has the name of Muhammad repeated in a circular interlacing pattern forming a circle, with the name 'Ali at the center, all in Kufic and pierced right through the stone. This is all surrounded by a circle of arabesque and of pierced Kufic, with a final circular band decorated with interlacing scrolls. The work of engraving and piercing shows both skill and perfection. The ribbed shell hood of the entrance salient, with its pierced medallion, appears here for the first time, and was the prototype of all the later cusped, ribbed, blind, keel-arch decoration which remains somewhat vogue on Cairo's buildings. The niches on either side of the entrance are each crowned with four tiers of stalactites. Set back within these are two smaller ones, each having a small fluted semi-dome. Above these two niches are two small ones, each having a fluted hood, supported by two engaged columns. The stalactites present the first introduction of this element into the design of a facade. To the left of the portal another shallow niche repeats the sunrise or shell motif with a medallion in the center. Above it, a circular clean cut in the stone reveals the brick wall, indicating that a medallion once existed there. Two lozenges, one with geometric carving and the other with a vase and plant motif, are surmounted on both sides of the missing medallion by two strange, carved panels. The one to the right represents a closed door, similar to the door of al-Hakim (now in the Islamic Museum), and the one to the left shows a niche with a geometric grill resembling a window. From its apex hangs a lamp. Undoubtedly, the al-Aqmar mosque has a highly symbolic meaning within a Shi'a context. The two plants standing in the vase has been interpreted to be symbolic of Hasan and Husayn, sons of the Caliph 'Ali by his wife Fatima. This pattern is also frequently repeated in Christian Coptic art, with many examples existing in the Coptic Museum in Old Cairo. The niches with the hanging lamp and closed door placed symmetrically on each side of the missing medallion might be more than mere decoration. There are three inscription bands that run along the facade. The first, at the summit, contains the name of Al Amir Bi-Ahkam-Allah and next to it is the name of his Wazir (Minister) Ma'mun al-Bata'ihi, together with his titles, and the date of foundation. The second runs at the springing of the entrance arch. This too contains the names of al- Ma'mun and his titles and the date of foundation. This fashion, the combination between the names and titles of the Caliph (Ruler) and Wazir, shows what influence the Ministers of State had attained towards the end of the Fatimids period. The third band runs at the level of the door lintel and only contains verses from the Quran. Another special feature of the facade is a chamfered corner carved with the names of Muhammad and 'Ali. 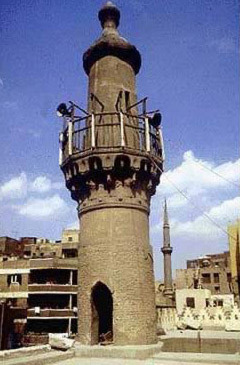 The original minaret has not survived. We can see on the left door jamb of the portal the circular base of the minaret built in the late fourteenth century by Amir Yalbugha al-Salami. It is a brick construct covered with stucco chevron carving and a molding with open work bosses and a stalactite cornice. Above the balcony, the structure is of even later date. The interior of the mosque has not retained much of its original form. The small sanctuary has three aisles and faces the courtyard with only a triple arcade. 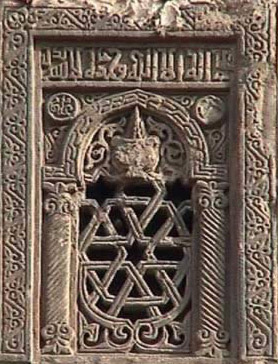 A fine example of Fatimid wood carving in situ with its panels of arabesque ornament can be seen on the closet door on the northwest side of the sanctuary. The three other arcades have only one aisle each. Bands of Quranic verse in Kufic script on an arabesque background still survive around the keel arches of the courtyard, which are supported on marble columns. 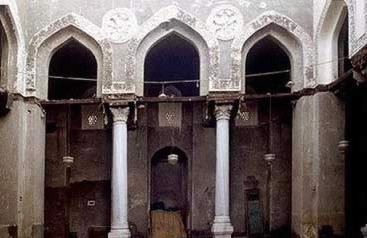 The keel arches did not appear in Egypt until the latter part of the Fatimids period, and were first seen in the dome of Sheikh Ynis, attributed to Badar al-Gamali. Here, the spandrels are decorated with shallow saucers composed of eight ribs radiating from a central medallion. A special feature of the interior architecture is that each bay's ceiling is covered by a shallow brick dome, instead of being flat, except for the aisle parallel to the qibla wall, which is wider than the rest and is covered with a flat wooden ceiling. As the mosque was in ruins when the Mamluk Amir Yalbugha al-Salami, during the reign of Sultan al Zahir Barquq, restored it in 1396/97 (799H), some scholars assume that he also restored the ceiling, which originally could have been flat. This type of ceiling is not known from the Fatimids period, but is used in the early fifteenth century at the mosque of Faraj Ibn Barquq. 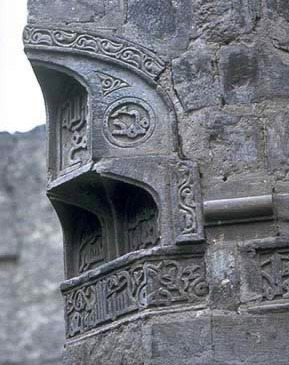 Yalbugha al-Salami also restored the minbar, which still nevertheless retains its Fatimid ornament, which can be observed on the entrance arch and at the back of the speaker's seat. Except for some wood carving on the beams and doors and a stucco inscription band along some of the arches, nothing of the original interior decoration remains. The mosque was once again restored in the nineteenth century during the reign of Muhammad 'Ali by Amir Sulayman Agha al-Silahdar, who also built the mosque across the street from this one. Originally, the mosque of Al-Aqmar was not at street level as it is today, but much higher than the street, standing above a row of shops. The rising ground level has now buried the these shops. However, at the time, they had an important function. The income of their rents were waqf, an endowment for the benefit of a pious institution for maintenance and to pay its personnel long after the founder's death.